The Sabre fighter was re-textured and partially re-modeled to include 4 machine guns (instead of 2). 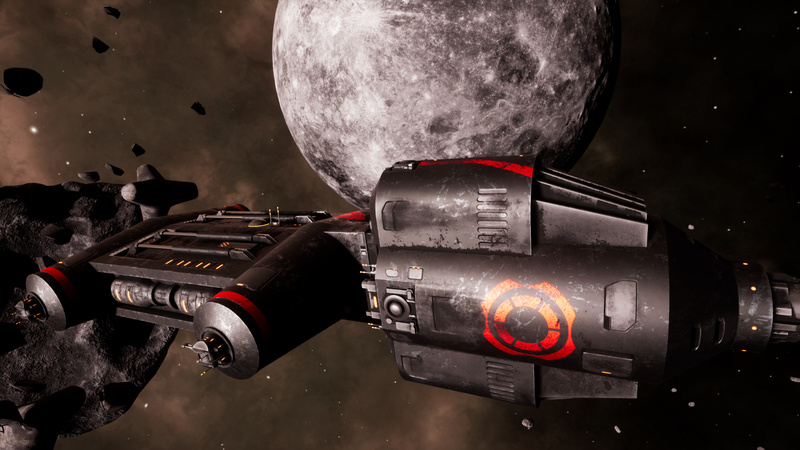 The Sabre Medic now has visible medic-markings (pictured below in Substance Painter). Before, there was no visual difference between a standard Sabre and a Sabre Medic. Now, players can visually distinguish between the Sabre variations. 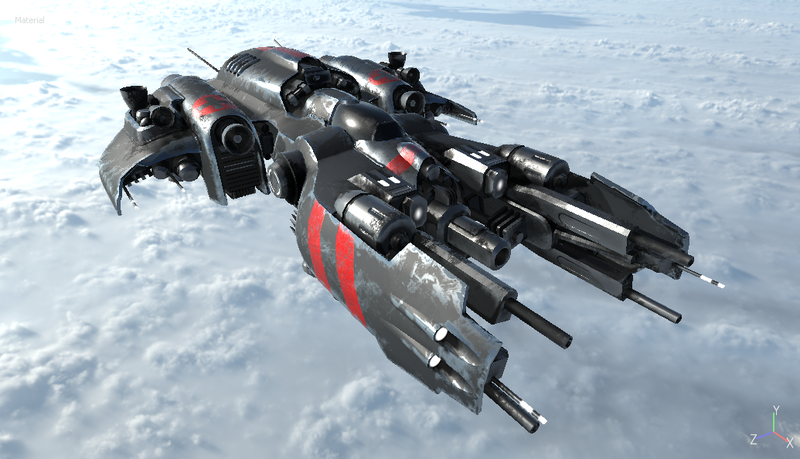 In-game, the new Sabre texture closely matches its appearance in Substance Painter. Previously, engine-glow was always visible and baked into the textures. Now, engine-glow is only visible when the thrusters are activated. This change gives the fighter a colder (and more realistic) appearance when idling. 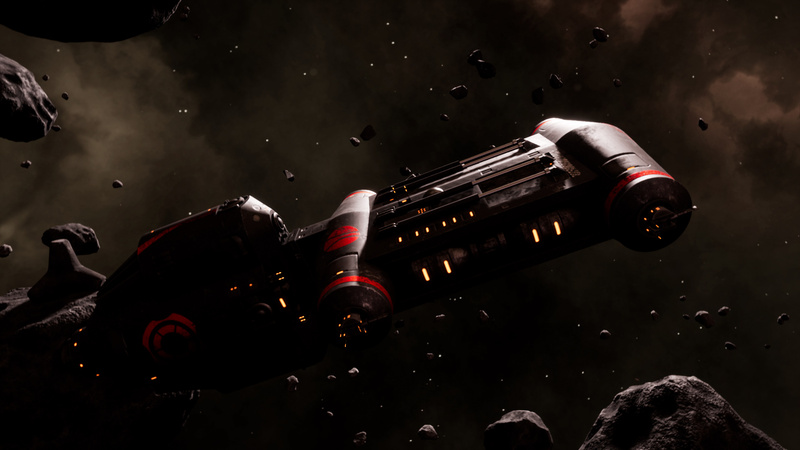 The Holliman frigate (featured in the Snare mission) received a complete re-texturing and some geometry changes. A large number of details were added, including bridge windows, hatches, lighted panels, and new decals. Additional geometry was added to the thrusters on the engine-component (visible below). Instead of having large, exposed holes, the thrusters now have a centered cap that conceivably prevents them from being easily damaged. Hand-painted grime from engine-exhaust is also visible. All in all, the Holliman consists of 5 models: engine, cargo, hydraulic doors, turret-bases, and turret-guns. 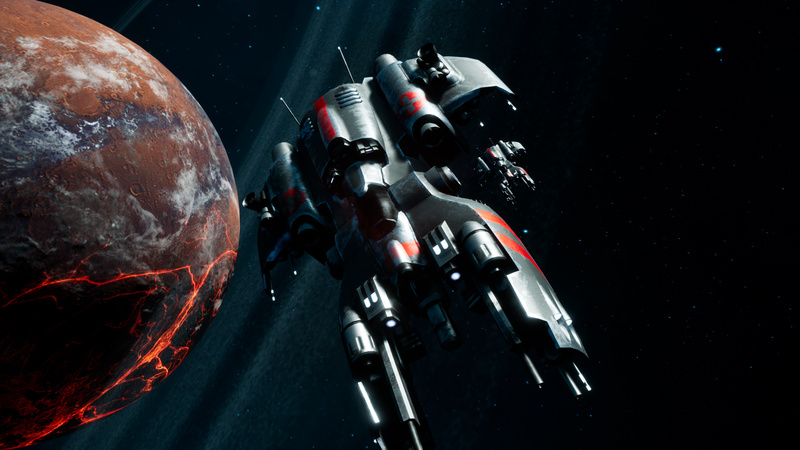 Each model had to be re-textured to match the new look. Motion-controllers are no longer required to play in VR. This allows a player to comfortably sit and play using a keyboard/mouse or joystick. Many players reported frustration with the motion-controller setup, as well as feeling nauseous. 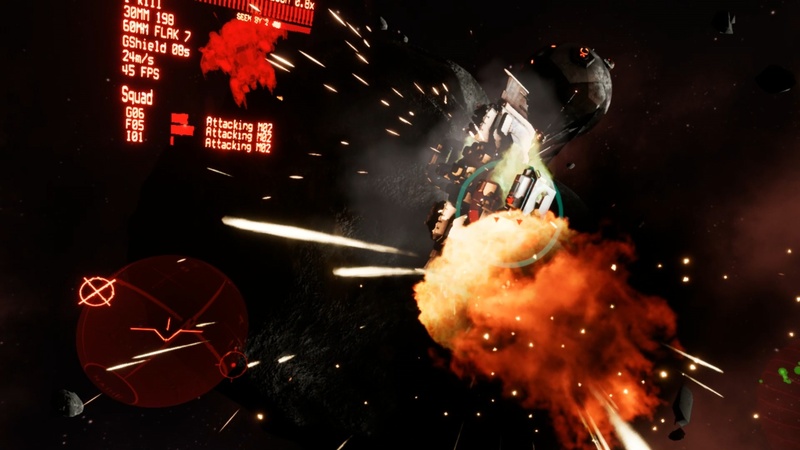 By eliminating the motion-controllers, players now report a more comfortable VR experience. Besides, there are not enough buttons on motion-controllers to support all the game's features. In addition, the HTC Vive now works on most setups (with some reported exceptions). A VR-resolution appropriate for the user's headset can now be selected from the VR-menu. Previously, all resolutions in VR were too low. To remedy this, the max screen-resolution (in the graphics-menu) was raised to support all VR headsets. For example, the HTC Vive uses a 140% screen-resolution, while the Oculus Rift uses 133%. Since the current resolution of UE4 doesn't auto-select VR-resolutions, the user has to set the appropriate resolution from either the graphics or VR-menu. 2 new Steam achievements have been added: Colonizer and Firefighter. These achievements are unlocked when the standalone missions Colonists and Firefight are completed, respectively. Both of these missions are particularly difficult, so dedicated achievements seemed appropriate. Since 0.9.6, the game is now packaged in PAK files instead of loose files. Debug-files are no longer included and config-files are no longer accessible. The development-console is still accessible in-game for debugging purposes. Due to a cleaner game-package, all levels load significantly faster.